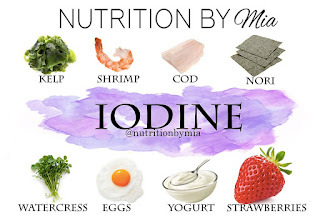 Iodine is an essential mineral that we get from the food we eat. The developing baby in the womb, babies and young children are at greatest risk from a diet deficient in iodine. Iodine is needed in very small but essential amounts by the human body. Iodine is essential to the production of thyroid hormone, which regulates body temperature, metabolic rate, reproduction, growth, blood cell production and nerve and muscle function. Thyroid hormone is produced in the thyroid gland, which is in the neck. While seafood is a good source of iodine, the amount of iodine in other food like milk and vegetables, depends on how much iodine is in the soil. 2... It regulate body temperature, blood cell production, Thyroid glands, nerve and muscle function. 3... It is important to your unborn child to develop all above. 4... It is available in your Healthy food.